Featuring an advanced composite spaceframe, this dedicated racing ship is the lightest ship on the track, even more so than the M50. The 'Blue Devil' is MISCs racing ship for the Murray Cup and they got a lot of it right in the first try. However, the ships thrusters are somewhat underpowered, resulting in excessive drift and pilots often struggling with long G-force exposure. These adaptations of the much discussed Razor are still racing ships, but deviate slightly from the original design to fulfill other roles away from the racetrack. They do still share most of its strengths, from its small frame to its comparatively large boost fuel capacity. 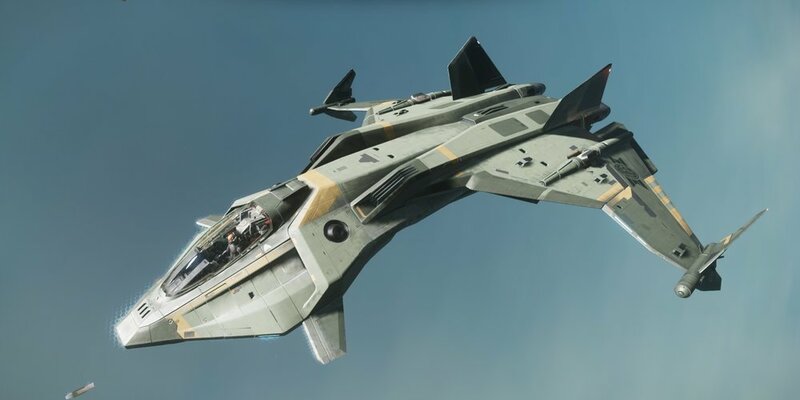 The pinnacle of Origin's 300-series of ships, the 350R features the highest theoretical top speed, but is limited by its bulky frame and heavy weight. Thanks to its raw engine power it is still a strong contender in high level races, even if it lacks the agility and grace of more refined ships like the M50. This interceptor design has been a longstanding favorite with Murray Cup pilots. While in theory the multipurpose design puts it at a slight disadvantage, the M50 is still one step ahead of more modern ships and maintains its reputation as the fastest ship on the New Horizon Raceway. The limited fuel capacity means pilots have to use Boost sparingly on the longer racetracks. CNOU's bid at making a dedicated racing ship comes in the form of the Mustang Gamma and its red twin brother, the Omega. The unconventional ship design allows for an unmatched cockpit view and great forward acceleration. This comes at the cost of sturdiness and boost fuel capacity, making the exotic Mustang the weapon of choice for daredevils and pilots who are 100% confident in their skills. This ship is not designed for racing. It's not particularly fast. Its acceleration is mediocre. It's as big and heavy as its cousin, the 350R, but only features a single engine. So why is it still a popular choice? To put it in one word, fuel. With a capacity that easily lasts for 10 laps on Defford Link, there is no need to ever stop using Afterburner or Boost in the 300i. The unruly handling is an acquired taste for sure, but the lap times speak for themselves. It might not win any beauty contests on the track, but the UEEs tried-and-true light fighter handles like a charm. The Gladius has been a race-winning choice in the open class and it has got enough speed to give less experienced pilots in superior ships a run for their money. Racing is probably not among the words that come to mind when looking at this flying hulk of metal. The Buccaneer is a true Wolf in Sheep’s clothing and a dark horse for the open class. It compares to the 300i in speed, but offers less rebellious handling at the cost of a smaller (but still plentiful) hydrogen tank.